At the launch of the third of five Platform Supply Vessels under contract with Eastern. Eastern Shipbuilding Group, Inc. has christened and launched the M/V BRAVANTE VII for Boldini S.A., BRAVANTE GROUP of Brazil. This is the third vessel launched in a series of five. The event was held on December 20, 2013 at Eastern’s Nelson Street Facility with hundreds of Eastern’s Employees and Guests. Attending from Bravante were Nuno Neves, William Grutter, Pedro Correa and Cristiana Marsillac along with several members that traveled from Brazil witnessing the launch of the third of five Platform Supply Vessels under contract with Eastern. 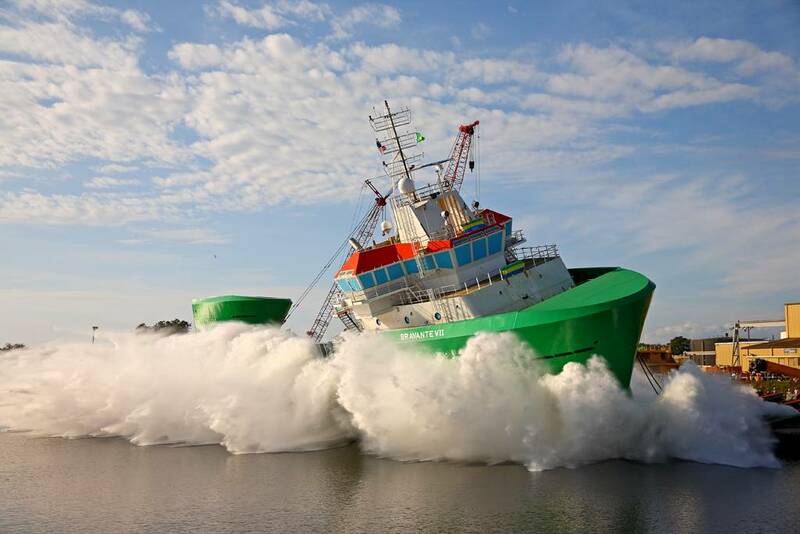 The first vessel the BRAVANTE V delivered in November 2013 and the BRAVANTE VI was launched in August of 2013 with final delivery set for January 2014. In special attendance for the BRAVANTE VII launch ceremony was Owen Doherty Acting Associate Administrator for the U.S. Maritime Administration (MARAD). Cristiana Marsillac, Bravante’s Offshore Director, had the honor of christening the vessel. Eastern’s President, Brian D’Isernia said a few words about the bright future of shipbuilding here in the United States, how this project led to more local jobs and his gratitude to Eastern’s skilled workers prior to the launch. The President of Bravante Group Nuno Neves, spoke about the journey taken to get to this great day, along with the quality of workmanship and the long term partnership between Bravante Group and Eastern Shipbuilding Group. Deacon Timothy Warner of Saint John’s Catholic Church located in Panama City, Florida performed the blessing of the vessel. The BRAVANTE VII is the third of five vessels in a series and are ABS A-1, SOLAS/IMO, FFV-1, DPS-2, AC Diesel-Electric powered, twin propulsion PSV’s. These high-tech vessels feature four Cummins 16-cylinder turbo-charged IMO Tier II diesel generator engines each rated at 1825 kW at 1,800 rpm. Cummins also furnished the four Marathon Model 744 690VAC main generators. Main propulsion power is provided by two 690VAC electric motors driving two Schottel Combi-Drives Single Fixed Pitch Propellers with Nozzles rated at 2,500 kW at 750 rpm each for a total of 6,700 Hp. Schottel also provides two STT 4 Fixed Pitch Reversing Tunnel Thrusters rated at 1,180 kW at 1,170 rpm, each with direct coupled Hyundai 690VAC electric motors. GE Energy Power Conversion provides the complete system integrated diesel electric package, including the thruster drives, motors, control systems, DP system, switchboards, motor control centers, automation and navigation/ communication electronics. These vessels are capable of a maximum speed of 14 knots with a cruising speed of 12 knots. The fully integrated bridge is arranged for increased visibility and features the latest technology in navigation and communication equipment.